People singing at KTV. Image source. Recently I went to KTV with a bunch of friends. 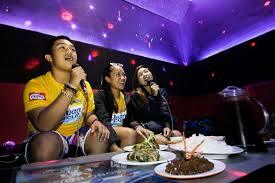 "KTV" is what karaoke places are called in China, and they're wayyy better than what Americans think karaoke is. At KTV, you go with your friends and rent a private room- you choose the size of the room based on how many people you have. There are 2 or 3 microphones, and tables and a booth to sit in. There's a computer screen where you search for songs and pick out the ones you want to sing. At a lot of places, the search function isn't user-friendly for people who may or may not read Chinese and are searching for English songs, but if you can figure out how to use it, you find they have almost any English song you would want. Anyway. I left around 1 am but apparently some of my friends stayed til like 2 or 3. And I heard that, toward the end, some of them were upset because "Joanna keeps putting her songs to the front." See at KTV, when you pick songs, they get put in the playlist of upcoming songs. They go to the end of the list. But there's also an option to move a song right to the top of the list, so it's the next one that will get played. And apparently, one member of the group was abusing this feature and putting all her songs at the top of the list, not giving other people a chance to sing their songs. All of this leads me to wonder, what's the etiquette for using the "put this song at the top of the list" feature? Seems like if everybody does it, then it's fine. And if nobody does it, then that would be fine too. But if some people keep doing it, while others don't even know that feature exists, well, that's a problem. This group of people was almost all international. In my experience when I've gone to KTV with a group of Chinese people, they look out for me- they tell me I should go ahead and pick more songs, they help me navigate the menu, they put a song at the top of the list for me if they feel like I haven't sung enough. In Chinese culture, being kind to "guests" is a really important value. And ideally, I think at KTV the right thing to do is to pay attention to who is singing a lot and who isn't, and if you notice somebody isn't singing any of the songs that come up, then go ask them "Do you want to sing another song? We can put one of yours at the top of the list." But this particular group of people was mostly from western countries where we have a more individualistic culture- where people mainly look out for themselves and wouldn't necessarily notice if someone is feeling left out. And maybe also, being from other countries, we were less familiar with how KTV works and how there is an option to put a song at the top of the list (available to people who are good at navigating Chinese menus! ), and in what situations that would be useful. These factors combined to create a situation where one person kept putting her songs at the top of the list, not giving other people a chance to sing, and it took a while for the rest of the group to realize what was happening and know how to handle it. Last month I wrote a post called From "Virtues Morality" To "Boundaries Morality", about 2 different frameworks for knowing what's "the right thing to do" in a particular situation. So I've been thinking, what's "the right thing to do" if I'm at KTV, I've picked a bunch of songs, but suspiciously none of my songs have been played yet, and I'm wondering if it's because other people are putting their songs at the top of the list. Let me tell you what I would do under "virtues morality." "Virtues morality" is about learning a bunch of "virtues" and then applying them to real-life situations. The virtues that seem relevant to this situation are "patience" and "put others first." If my songs are on the list but they haven't been played yet, well I just need to "be patient." If other people are putting their songs before mine, well I should let them do it- "put others first" instead of standing up for myself. Haha, "stand up for yourself" is SO NOT a "virtue." So, in this hypothetical, I would sit there, thinking about how unfair it was. Thinking that "the way it's supposed to work" is everyone's songs go to the end of the list and they're played in the order they're selected and nobody uses the "top of the list" function. I would judge the other people for putting their songs at the top; I would feel like I'm so superior and godly because I'm "submitting" to it instead of standing up for myself. I would tell myself that it's okay, I know I need to "do the right thing" and just "be patient." And I would get gradually angrier and angrier as I wait and wait and my songs keep getting pushed back. Eventually I might get so frustrated about how I'm working so hard to "do the right thing" and it's not working, and I can't take it any more, and I end up yelling at someone in anger. And then, under "virtues morality," I would feel bad, oh I sinned, my sin was that I broke under the strain of my emotions, I wasn't able to keep "submitting" like I should. Godly people are able to repress that forever. They never reach a breaking point where they finally demand to be treated fairly. In church I learned to "put others first" and "submit" and "turn the other cheek." They never explicitly said "don't stand up for yourself"- they didn't say it would be a "sin" to speak up and say "hey what about my turn to sing?" Of course a normal person would say that, and that's just fine. But. Wouldn't it be better and more godly to not stand up for myself? As Christians, we're supposed to always strive for perfection- a standard we can never reach. Sure, a regular person- a regular Christian- would say "hey what about my songs?" but if I'm really really really "on fire for God", truly obeying and submitting every single moment of my life, all-in, 100%, all my heart, all my soul, all my strength, all my mind... then I would just let it happen and "trust God" to make it all okay. After all, it's a sin to want something too much. That would be "making it an idol." Nothing belongs to you anyway, so you need to be okay with your things getting taken away. That's how it would go under "virtues morality." And I'm struck by how unnecessary it all is- all the negative emotions, the anger, the trying-so-hard-to-just-submit-when-people-treat-me-like-this. It's all unnecessary. In reality, nobody at KTV is actually trying to treat you unfairly. They probably just didn't realize that you weren't getting in the mix and putting your own songs at the top. If you would just communicate about it, there would be no problem at all. In order to communicate, though, you have to hold the belief that "there are N people in our group, so on average 1 out of every N songs should be a song I picked, and if it seems to be a much lower proportion than that, then I should try to find out why and correct the problem." It requires believing that your needs and your desires have an equal standing with everybody else's. It requires a belief that you should NOT "always put others first." It's NOT true that "yes it's fine to speak up and ask that I get an equal share, but it's BETTER and MORE GODLY not to." No. Nothing like that. It's not more "moral" to give up your rights. (Unless you're in an unusual circumstance where there really isn't enough for everyone and you feel it makes sense to prioritize other people over yourself.) In fact, living under that kind of ideology is TERRIBLE for one's emotional health. And here's something I didn't believe under "virtues morality," but I do now: Your emotional health matters. There's nothing good/healthy/godly about just sitting around accepting it when people don't treat you equally. Don't just sit there and hope that because you're "submitting" and "doing the right thing," the situation will just *magically* correct itself. Stand up for yourself. Politely, nicely, communicate about how you think you're not getting your fair share. You deserve that, and it's right to advocate for it.